FULL Video: 65th Miss Universe Coronation 2016 (ABS-CBN, TV5) - Balita Boss! The 65th Miss Universe Pageant (2016-2017) aired on Monday in Philippine TV on GMA Network, ABS-CBN and TV5 with Steve Harvey returning as a host, alongside new co-host Ashley Graham. 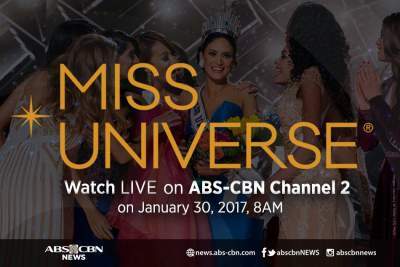 This year's Miss Universe was broadcasted live from the Mall of Asian Arena in Manila on January 30, 8 - 11 a.m. (Philippine Time). Watch Miss Universe 2016 Full video below. On the pageant, 86 contestants from around the world will introduce themselves before the top 13 are announced. The finalists will compete in swimwear and evening gown before a question-and-answer portion. The judges are Cynthia Bailey (Actress, model, and The Real Housewives of Atlanta star), Mickey Boardman (Editorial director for Paper magazine), Francine LeFrak (Theatrical, television, and film producer), Leila Lopes (Miss Universe 2011 from Angola), Sushmita Sen (Miss Universe 1994 from India), and Dayanara Torres (Miss Universe 1993 from Puerto Rico).